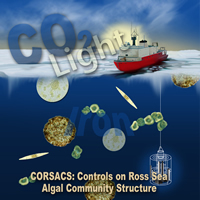 CORSACS (Controls on Ross Sea Algal Community Structure) is a three-year, multi-institution program to determine how levels of iron, sunlight, and carbon dioxide interact to determine the types of algae that occur in the southern Ross Sea, Antarctica. The VIMS component of the CORSACS program is headed by Dr. Walker Smith. The composition of the Ross Sea algal community is important because it impacts local food webs and can ultimately affect the atmospheric concentration of the greenhouse gas carbon dioxide. Different types of algae, such as Phaeocystis antarctica and diatoms, respond differently to increasing levels of dissolved carbon dioxide, take up carbon dioxide and other forms of inorganic carbon at different rates, and are recycled in different ways. Funding for the CORSACS project comes from the National Science Foundation's Office of Polar Programs. This highly competitive program awards approximately 110 research grants each year to U.S. scientists for study in the Arctic and Antarctic.